Everything they touch turns to pure excitement! 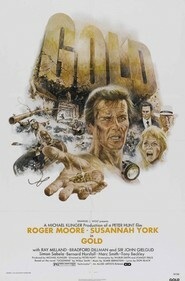 After a rock fall at a South African gold mine, the rescue party, headed by Rod Slater (Roger Moore) are puzzled to discover the body of general manager Frank Lemmer in the prohibited Big Dyke area of the mine. Meanwhile in London, the mine's managing director, Manfred Steynerr, is hatching a plot against its owner Harry Hirschfeld (Ray Milland) with English financier Farrell (John Gielgud). There is a vast underground lake, which if released would flood and destroy the gold field, raising the price of gold. This is the project Lemmer was involved with when he met his death. Slater must now be persuaded - innocently - to take his place and is shown a doctored copy of a survey showing a stream of gold beyond the Big Dyke, which Steyner encourages him to excavate. Slater encounters a plot of deception and intrigue, as well as finding romance in the form of Steynerr's wife Terry (Susnnah York). Slater is called on to save the mine and its workers when the conspirators try to blow it up.